Securing the surgical margin is the most essential and important task in curative surgery. However, it is difficult to accurately identify the tumor location during laparoscopic surgery for gastric cancer, and existing methods, such as preoperative endoscopic marking with tattooing and clipping, have multiple disadvantages. We investigated the feasibility and safety of indocyanine green (ICG) fluorescence marking for determining the tumor location during laparoscopic gastrectomy. We retrospectively analyzed preoperative and perioperative data from consecutive patients with gastric cancer undergoing planned laparoscopic distal gastrectomy. Data was maintained in a prospectively compiled surgical database, and patients were categorized into ICG (n = 84) or non-ICG (n = 174) groups based on whether they underwent preoperative endoscopic mucosal ICG injection. One-to-one propensity score matching (PSM) was performed to compare outcomes between the two groups. We included 84 patient pairs after PSM, and there were no significant differences in preoperative patient characteristics. The ICG group had shorter procedure time (p < 0.001), lower estimated blood loss (p = 0.005), and significantly shorter postoperative hospital stay (p < 0.001). Positive resection margins were confirmed in five cases (6.0%) in the non-ICG group, whereas there were none in the ICG group (p = 0.008). Real-time confirmation was possible during laparoscopy, and the injected ICG did not affect the surgical procedure or result in adverse events. ICG fluorescence imaging is feasible and safe and can potentially be used as a tumor-marking agent for determining the surgical resection line. The study has not been presented at any regional, national, or international meeting. Ushimaru designed the study and wrote the initial draft of the manuscript. Omori contributed to the interpretation of the data and to the critical revision of the manuscript for important intellectual content. All the other authors (Fujiwara, Yanagimoto, Sugimura, Yamamoto, Moon, Miyata, Ohue, and Yano) contributed to data collection and interpretation and critical review of the manuscript. All the authors have read and approved the final version of the manuscript and have agreed to the accountability of all aspects of the study, ensuring that any queries related to the accuracy or integrity of any part of the work are answerable. This study was approved by the Institutional Review Board of the Osaka International Cancer Institute. All patients signed a written informed consent. Data collection and analysis were performed in compliance with the Helsinki Declaration of 1975. Drs. Yuki Ushimaru, Takeshi Omori, Yoshiyuki Fujiwara, Yoshitomo Yanagimoto, Keijiro Sugimura, Kazuyoshi Yamamoto, Jeong-Ho Moon, Hiroshi Miyata, Masayuki Ohue, and Masahiko Yano have no conflicts of interest or financial ties to declare. There are no funding sources for this study or any associated financial conflicts. Hur H, Son SY, Cho YK, Han SU. 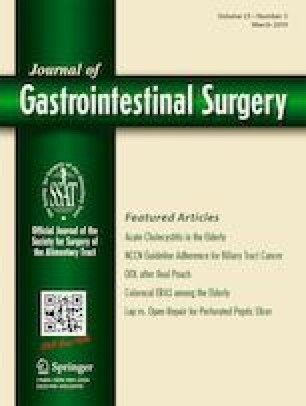 Intraoperative gastroscopy for tumor localization in laparoscopic surgery for gastric adenocarcinoma. Journal of Visualized Experiments: JoVE. 2016(114). https://doi.org/10.3791/53170.